Western Digital (WD) has a good market share when it comes to storage devices. But it never had flash storage devices. By acquiring SanDisk, WD instantly entered in this segment and got the number 2 spot just behind Samsung. SanDisk has made huge advancements in flash technology and, therefore, WD unlocked vast flash resources in the form of SanDisk’s huge R&D and patented technology which is leading the industry. SSD technology is very expensive and WD has made its mark in the market by offering quality products at affordable prices. Clearly, this wasn’t possible in the case of SSD’s back when WD brought its own SSD’s on the market in the year 2010. They were very expensive and, therefore, were rejected by the masses. With SanDisk’s advanced flash technology, WD has been able to achieve its target. WD has launched series of SSD’s with capacities of 250GB all the way up to 1TB and are available in both 2.5-inch and M.2 formats, at aggressive prices. 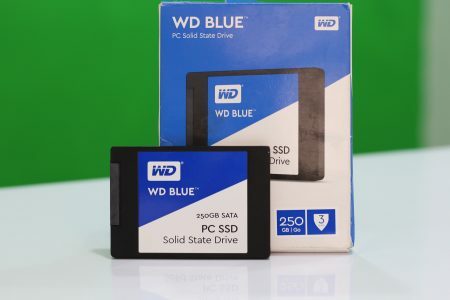 Fortunately, WD sent us its latest SSD, the WD Blue 250GB SATA SSD. We were excited to see its performance test results and also the fact that its price is at par with the competition. So following are our opinion of this SSD. We installed the WD 2.5″ SSD as our prime storage in our PC. We then installed Windows 10 OS on it. It took about 12 minutes to complete the installation which seems quite a long time, but we installed it using the USB 2.0 port. By using USB 3.0 port, this time will be well under 5 minutes. For the performance test we used SSD testing software’s like PassMark and AS SSD and started running benchmarks. Note that the basic drivers were not installed before runnning the tests. Above benchmark results are from AS SSD and below are the results from PassMark performance test. We ran each benchmark 3 times just to make sure we got correct readings. As you can see, sequential read/write speeds are just under 500 MB/s. These results are on a system that is not fully optimized. Therefore, on a fully optimized system, you can expect to get an additional of 30 MB/s read/write speed easily. These WD Blue SSD’s are based on the Marvell 88SS1074 “Dean” 4-channel controller. This advanced controller supports low-density parity check (LDPC) error correction code. This is used for error detection and correction. What is noteworthy is that LDPC is able to extract more endurance from the underlying flash than BCH ECC method. This results directly in the longer life of the SSD compared to other SSD’s using different technology. All three WD Blue SSD’s capacities ship with a 3-year warranty that WD limited with terabytes written (TBW) endurance rating. It basically is an indicator that tells you about the amount of data you can write to the SSD before the warranty expires. The Blue offers increased endurance compared to the previous SSD’s offered by SanDisk and other competitors. The Western Digital Blue series SSD’s are now available on Amazon. The 250GB drive that we have with us is priced at 7,800RS. The WD Blue 500GB SSD seems the most value for money as it is priced at 14,999RS. Whereas, the 1TB is priced much higher at 26,917RS. Flash technology is still new and a bit too expensive for the regular consumers to buy. But as the technology is getting advanced, we are seeing aggressive pricing of SSD’s. WD has offered a great product at a very good price. If you’re building a performance workstation, gaming PC this SSD will certainly will live up to its speed expectation at an affordable price.